Dragon Cultists are the restless spirits of members of the ancient Dragon Cult who chose to take their own lives rather than fall to King Harald's army. They only appear to attack invaders in Forelhost. Dragon cultists make use of ancient Nord weapons and armor, and may also carry a dragon priest dagger. Some cultists are capable of using Destruction magic. 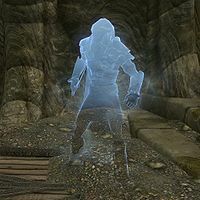 Dragon Cultists make the sounds of Draugr, even though normally ghosts don't show that behavior.